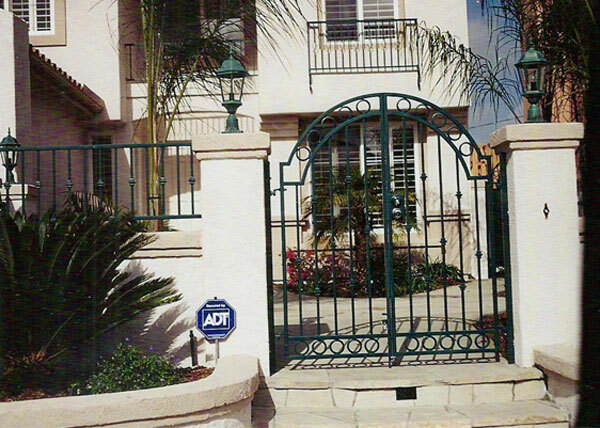 G2 This steel apartment security gate in Chula Vista, CA was installed at the front entrance of a private community. It offers access through use of a telephone and keypad. 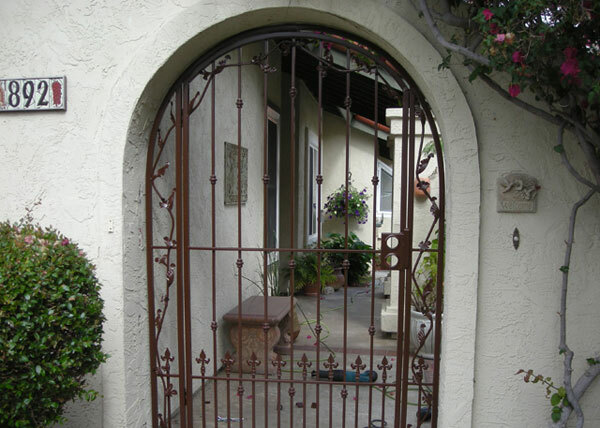 G3 The gate frame of this Mediterranean style steel gate in Pacific Beach, CA is made using 1.5" steel tubing with &frac58;" verticals with attached decorative knuckles. 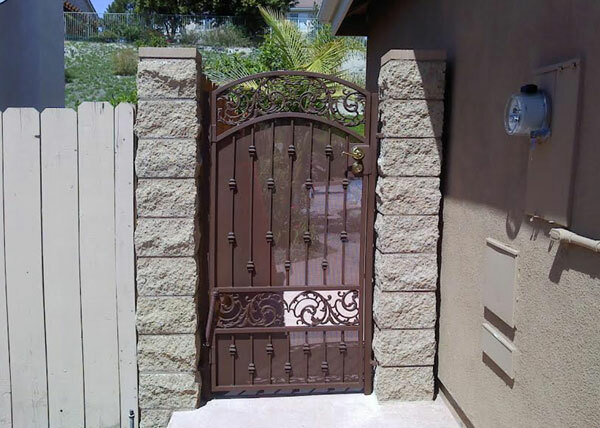 G4 This residential steel entry gate in Chula Vista, CA was custom made to fit into the existing archway. Doggie pickets on the lower part of the arched French style gate keep the owner's small dog inside. 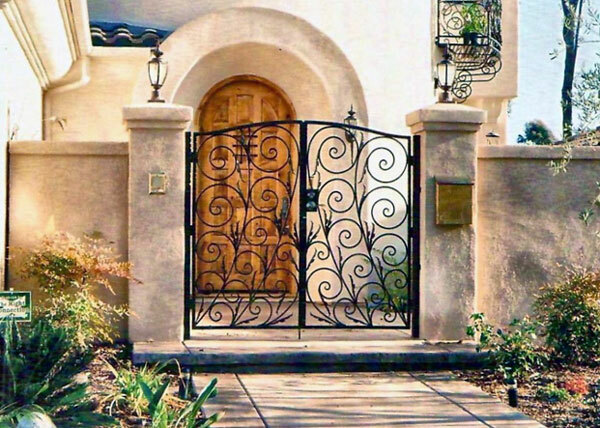 G5 This Mediterranean style steel entry gate in Eastlake, CA features a combination of cast aluminum designs below the upper horizontal and steel "S" scrolls. G8 B.A. 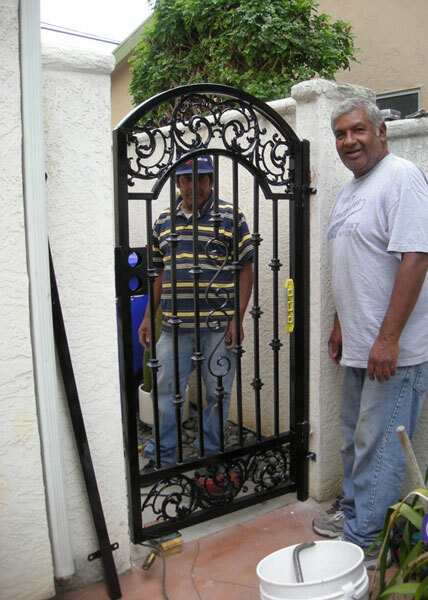 Ramirez & Sons completed a residential gate installation in Chula Vista, CA. This courtyard gate is made from hand forged steel and features decorative knuckles. 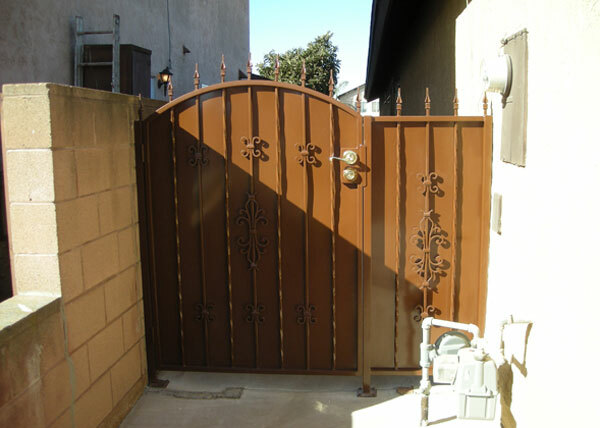 G9 We installed this residential steel side gate in Imperial Beach, CA. 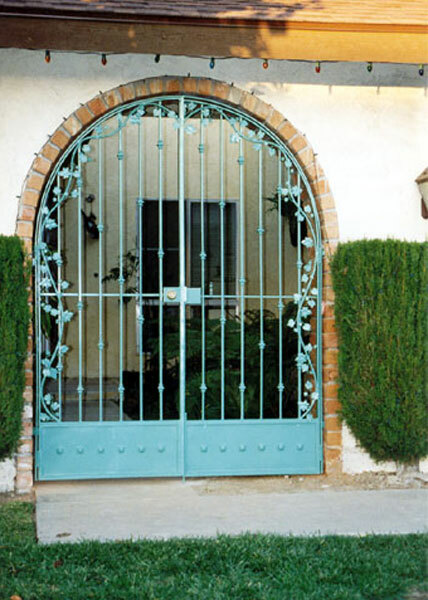 The arched Spanish style gate has decorative spears on top for additional security. 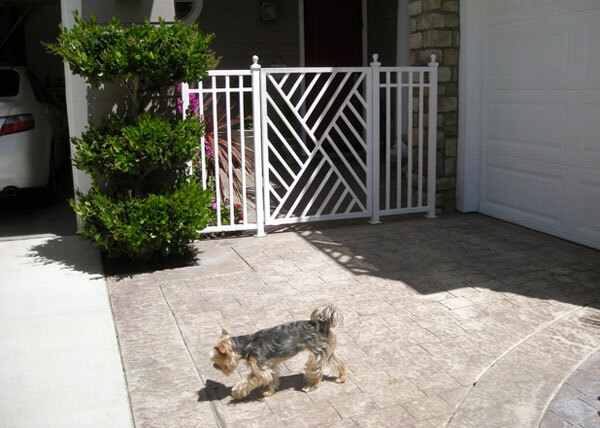 The sheet metal backing add privacy and keeps our client's pets safely in their yard. G10 After our client gave us a sketch of the gate they wanted, our skilled fabricators made a full size chalk rendering of the gate for our client to approve. 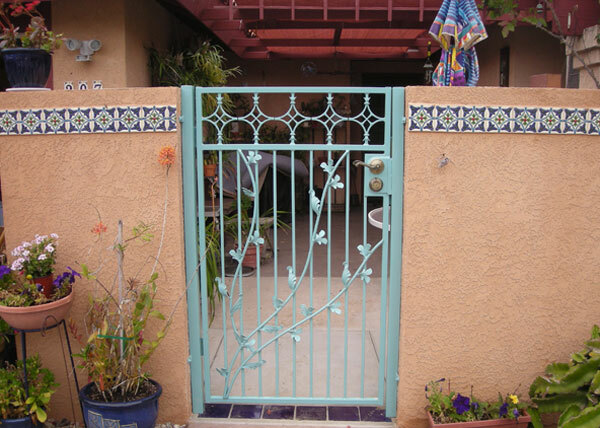 This steel Spanish entry gate in Pacific Beach, CA is the finished result. G11 B.A. 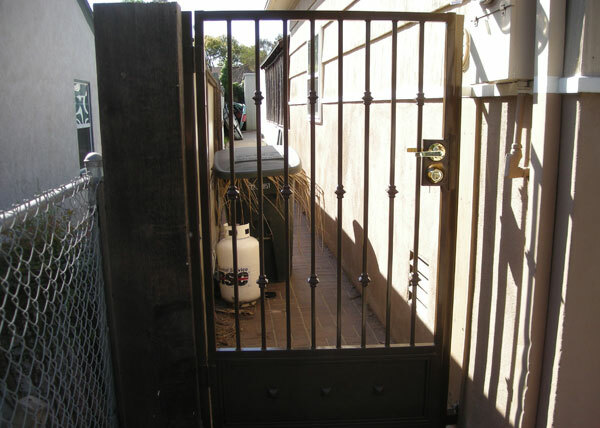 Ramirez & Sons completed a residential steel gate installation in San Diego, CA. 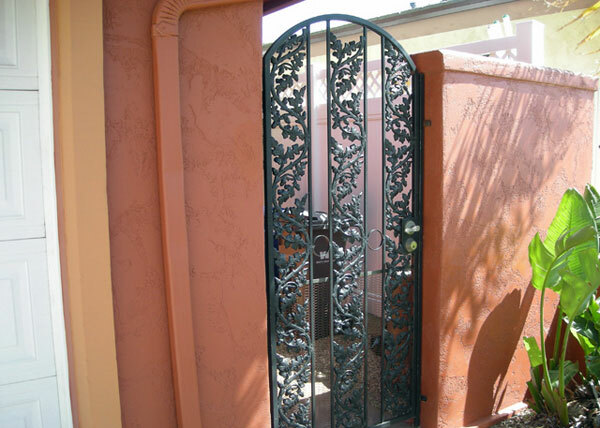 This modern steel gate was designed by the homeowner and features copper inserts. 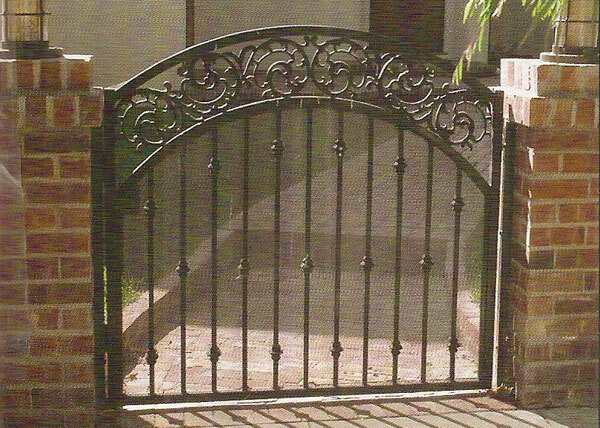 We fabricated the gate based on a sketch provided by the client. 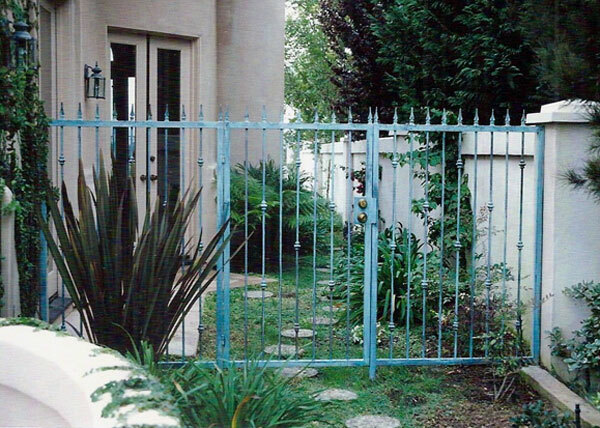 G14 This side entry gate in Chula Vista, CA was made using a 1" steel tube frame with ½" tubular verticals with knuckle designs evenly placed throughout. Decorative casting designs are placed below the upper horizontal above the lower horizontal. 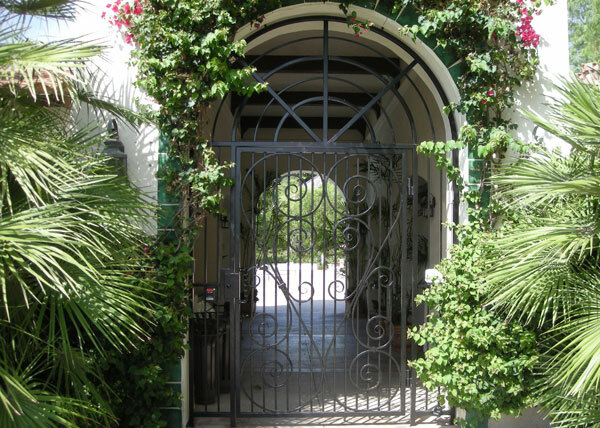 G15 BA Ramirez completed a beautiful residential entry gate installation in Rancho Santa Fe, CA. 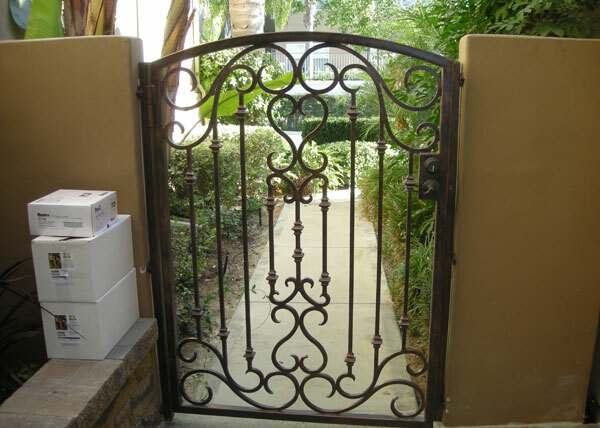 The entry gate features hand forged scroll designs and a 2" x 4" steel frame. It has been coated with a flat black finish. G17 This residential entry gate has hand forged designs below the upper arched horizontal. There are knuckle designs evenly placed on the vertical pickets. 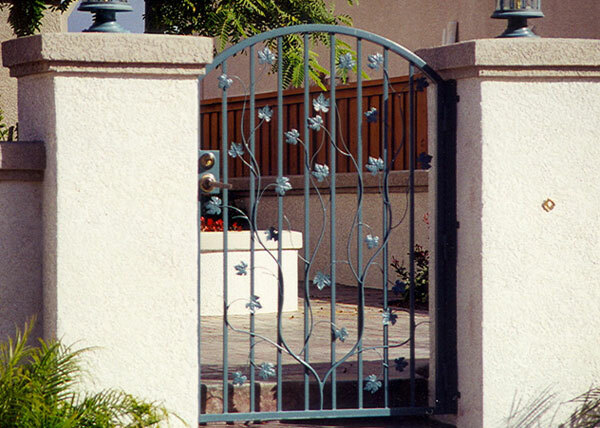 The lower part of the gate has a solid "kick plate" with decorative designs placed on the lower plate. 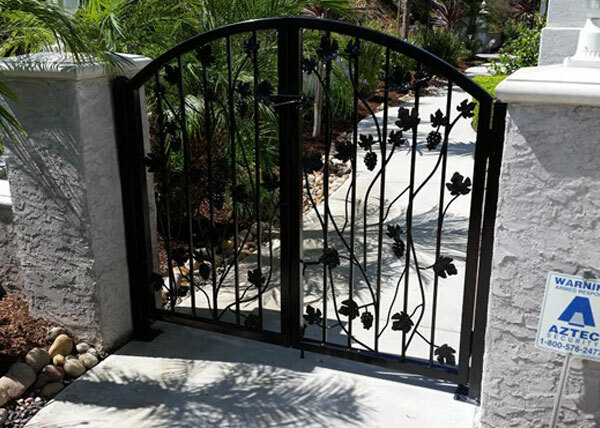 G18 This gate is a combination of decorative castings below the upper horizontal and vines with forged leaves attached to the vertical ½ solid steel pickets. A deadbolt lock and passage handle offer security for our clients home. The gate has a powder coat paint finish. G19 The arched design of this Mediterranean style side gate in Bonita, CA blends in nicely with the cast aluminum designs underneath. A deadbolt lock and passage handle make for a great design. 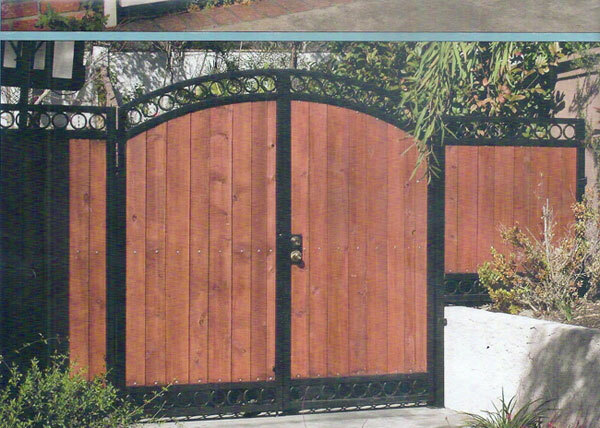 G22 We completed a residential double gate installation in Bay Park, CA. B.A. 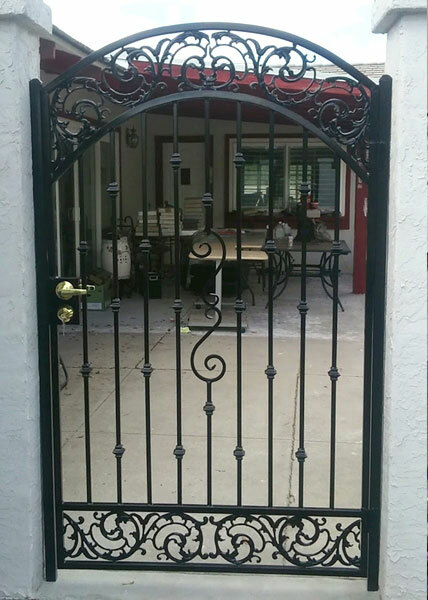 Ramirez & Sons installed this double gate at the front of this residence. The designs were hand forged by our master craftsmen. 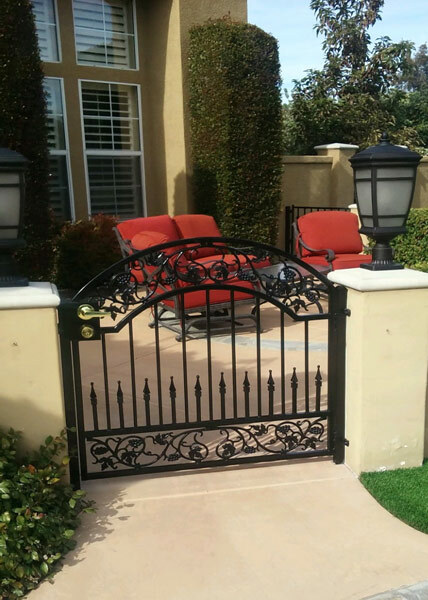 G24 This residential gate installed in Carlsbad CA has ornate cast iron designs. The solid sheet metal backing gives privacy into our clients back yard. The gate is made with a 1" steel tube frame and &frac58;" verticals. 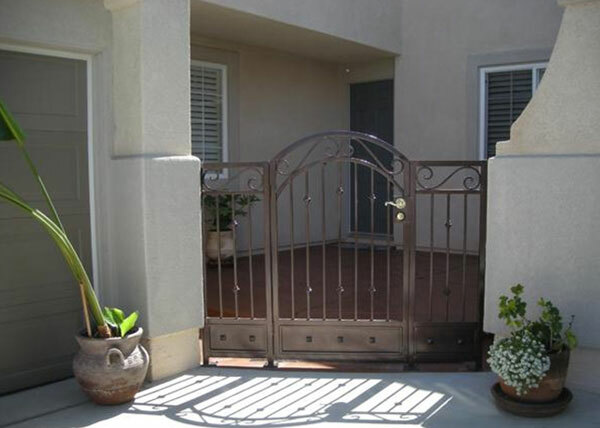 G25 This custom made steel entry gate in Bonita, CA provides this home with privacy. 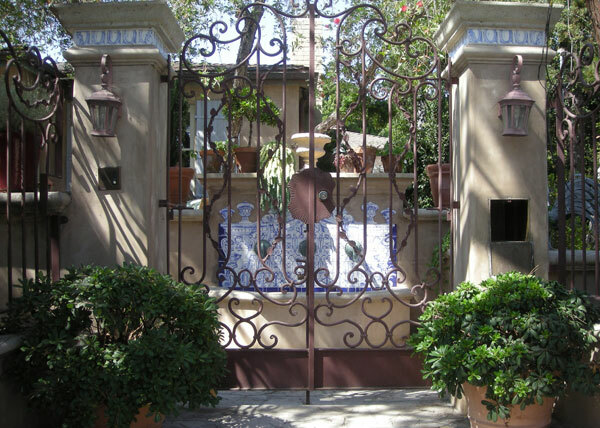 The arch of the Mediterranean style gate features bird of paradise castings and its pickets have evenly placed knuckle designs. 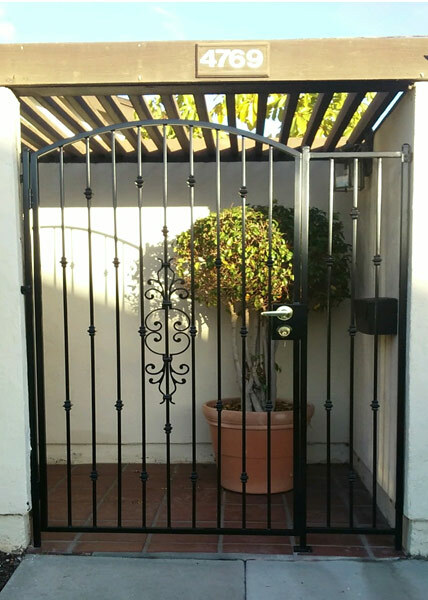 G27 This residential steel gate in Pacific Beach, CA was installed at the home's entrance. 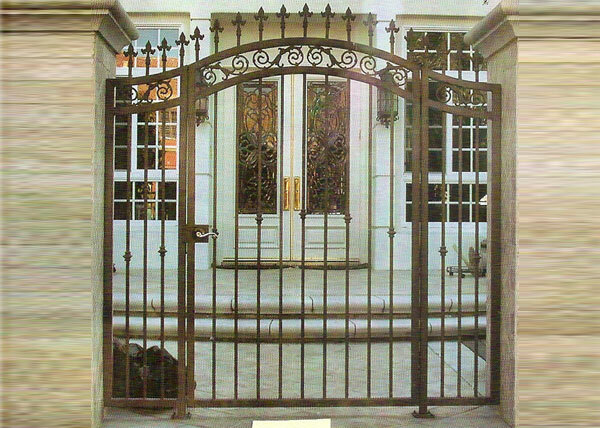 The Italian style steel entry gate has a built in electronic lock controlled by the homeowner. 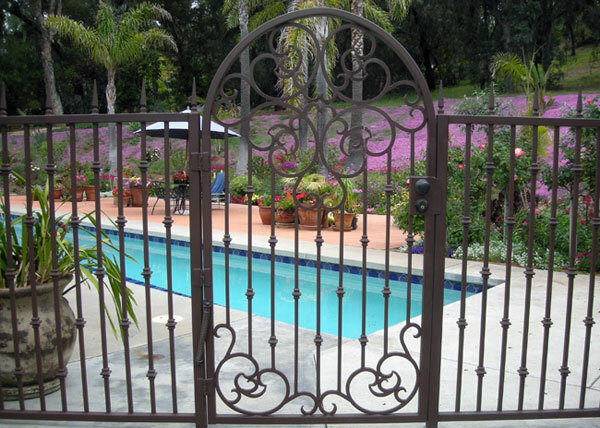 The designs are hand forged and the gate has a custom powder coat paint finish. G28 This gate was built for backyard privacy. Using 1.5" steel tube for the frame and &frac58;" tube for the verticals, sheet metal is attached and the fence and gate is then powder coat finished. 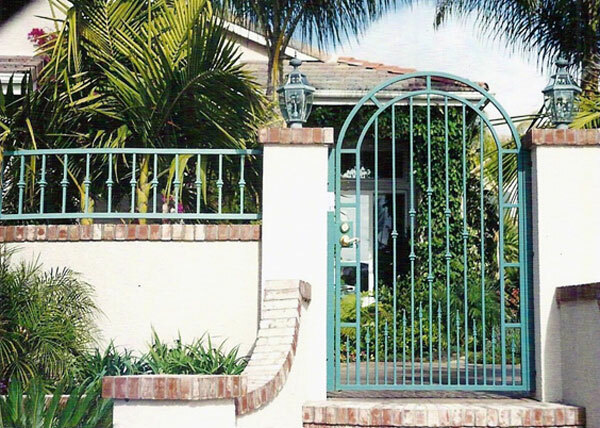 Installed in Bonita CA, the arched gate with the side fence panels offer security and privacy. 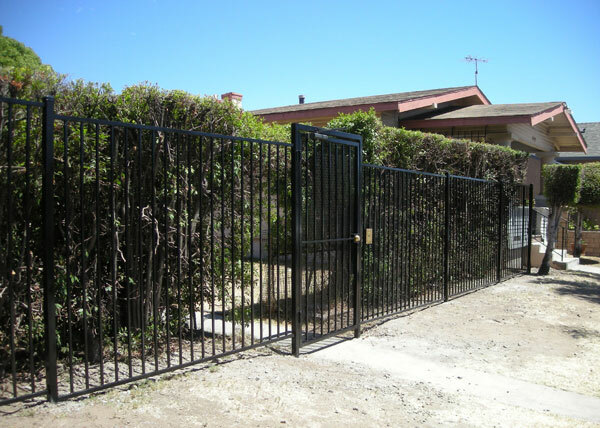 G29 This project combines the use of a security entry gate with 6' high fencing. The fencing is made using 1" steel tube for the horizontals and &frac58;" tube steel for the verticals. The project has a zinc primer undercoat with a black powder coat paint finish. G30 B.A. 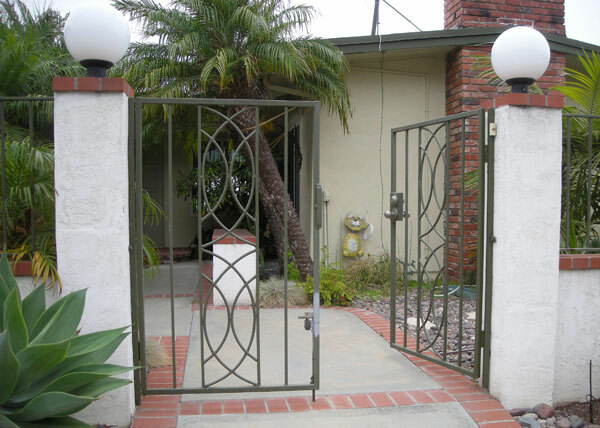 Ramirez & Sons completed a residential steel gate installation in San Diego, CA. 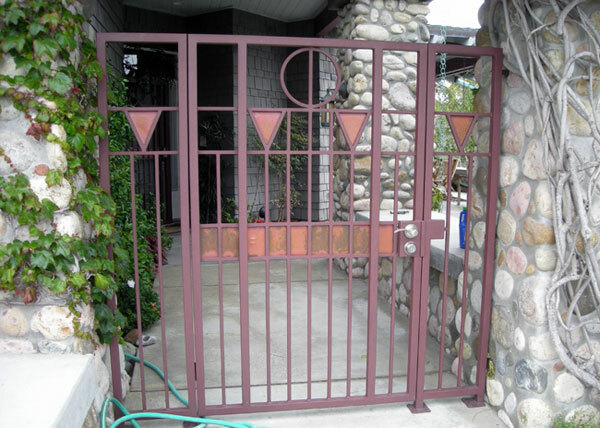 This modern steel gate was designed by the homeowner and features copper inserts. We fabricated the gate based on a sketch provided by the client. 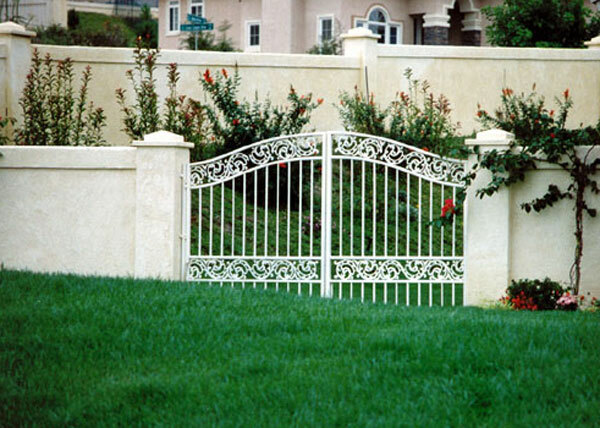 G32 This gate features "oak leaf" castings in three rows that give a climbing leaf branch look. 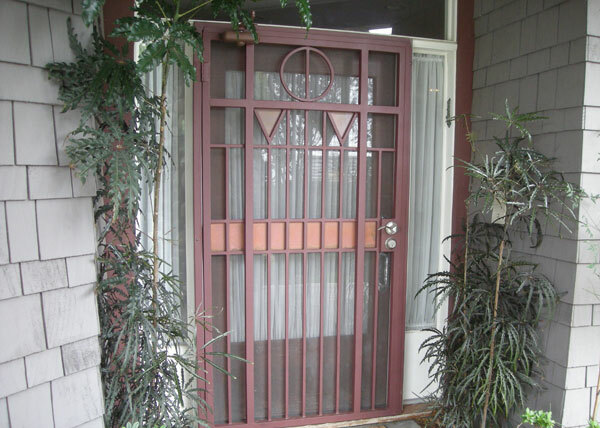 The designs are set within the 1" steel tube frame with the gate having a deadbolt and door handle built into the gate. 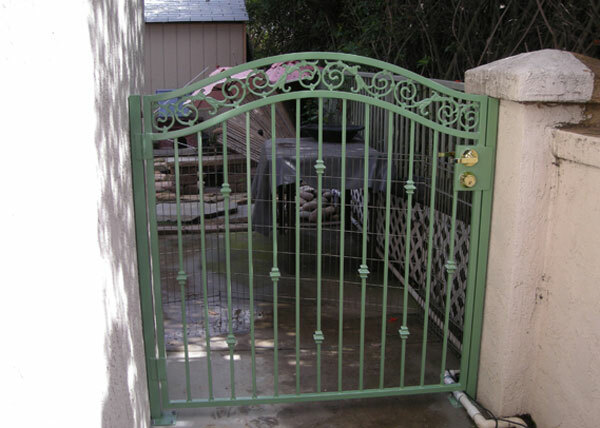 The side yard of the home is secured with this residential style gate. 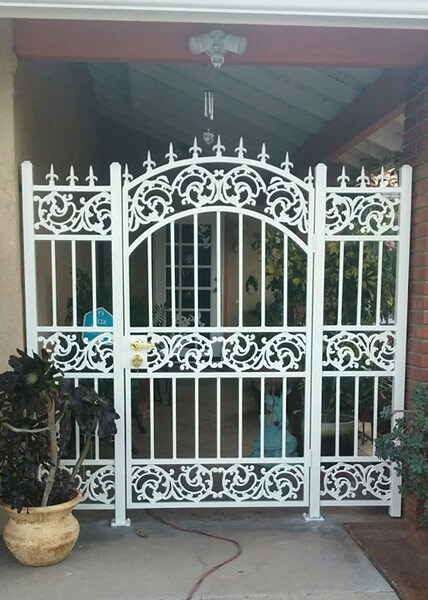 G35 Installed in Eastlake, a suburb of Chula Vista CA, this gate was installed at the front of a home. 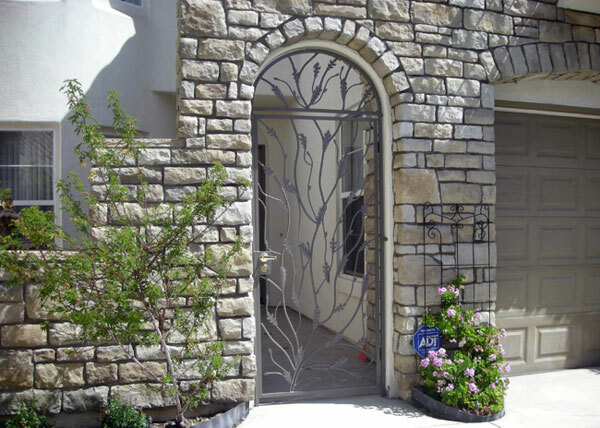 Combining highly detailed casting designs with decorative knuckles and spears, this residential gate with a European design adds security and style to the front of this home. 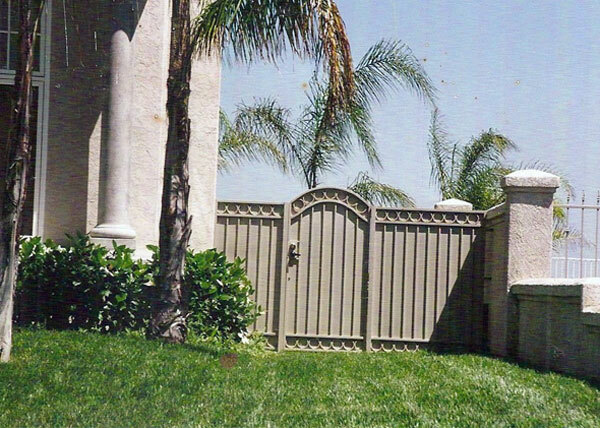 G38 Located in Poway CA, this side yard "Retro" style gate secures the back yard of this residential home. The retro designs below the upper horizontal is a out of the ordinary look. 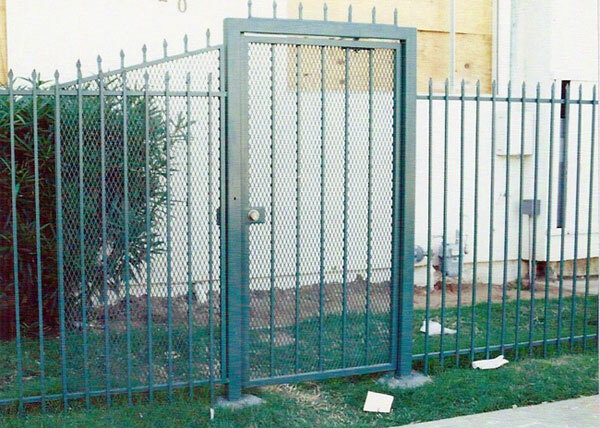 G39 This commercial style gate is located at a school site in Otay Ranch CA. 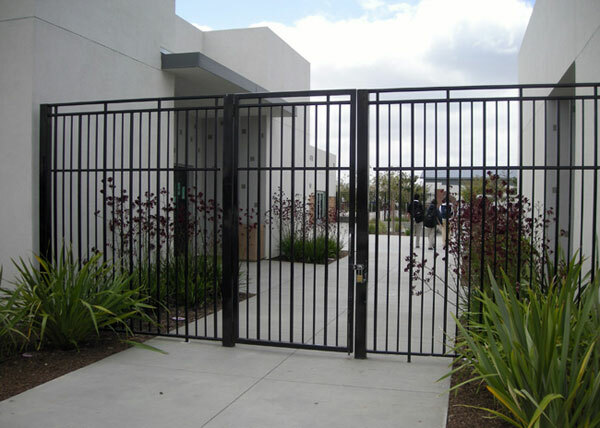 Supported by heavy 4" steel posts, the 1.5" steel tube framed gate and fence is designed for secured access to the school campus. G40 This gate is at the front entrance to a home in Alpine CA. It has a 1" steel tube frame with ½" verticals. 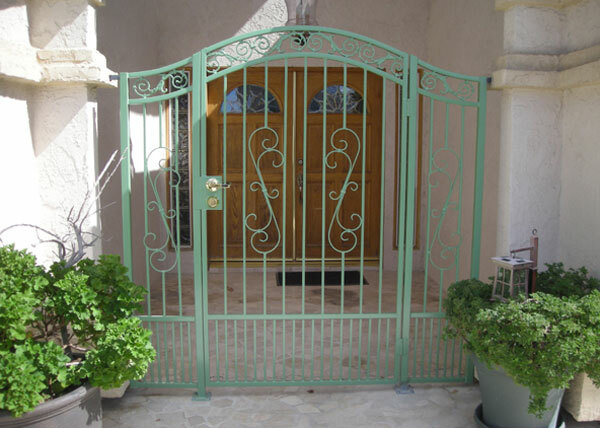 There are knuckle designs evenly placed in the gate and "doggie" pickets at the lower part of the gate. 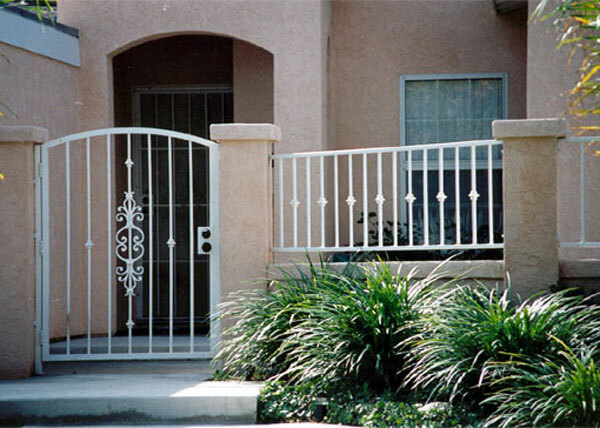 G42 This commercial style gate is made for security at a San Diego apartment complex. Made with a 3" x 3" heavy duty jamb and 1.5" steel tube frame, the gate has expanded metal backing to allow for a keyed entry lock and free turning exit handle. G43 The simplistic style and design of this gate and fence is a perfect style at the entrance to this condo project. The simple arch and wavy center bars in the gate are all the design needed. 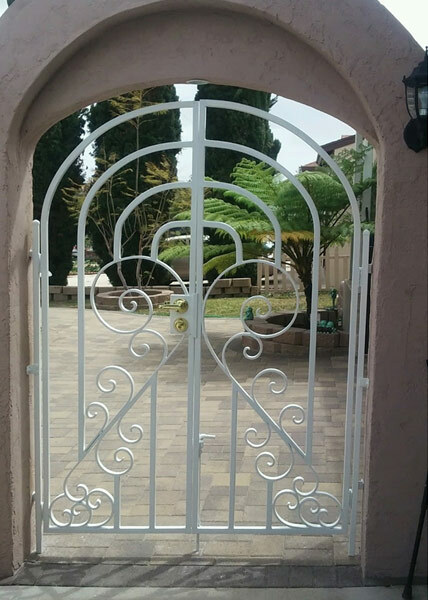 Installed in Encinitas CA, the gate is powder coat finished "gloss white"
G44 This hand forged style gate was made for our clients pool area in Rancho Santa Fe. 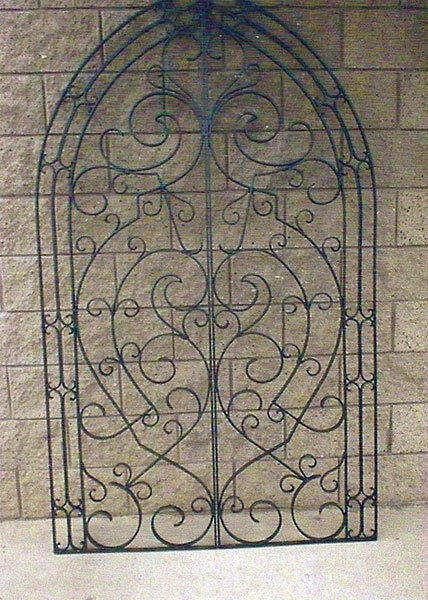 The designs in the arch and lower part of the gate were made from ½" solid steel that was heated, hammered and formed into the designs you see in the picture. The gate and fence was finished with a powder coat "bronze" coating. 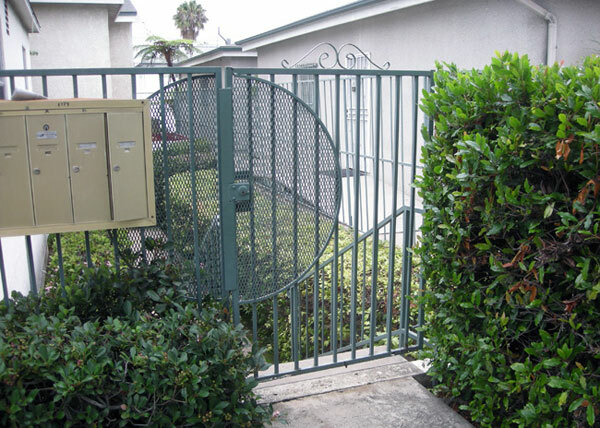 G46 We installed this steel security gate in Chula Vista, CA at the front entrance of a private community. The gate is made from steel tubes and offers access through use of a telephone and keypad. G47 B.A. 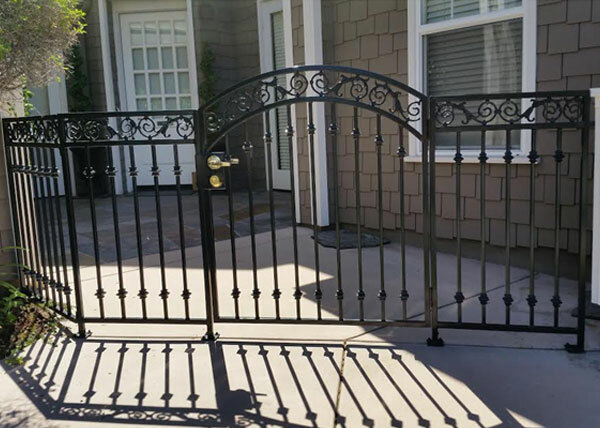 Ramirez & Sons built and installed this hand forged gate in Rancho Bernardo, CA. 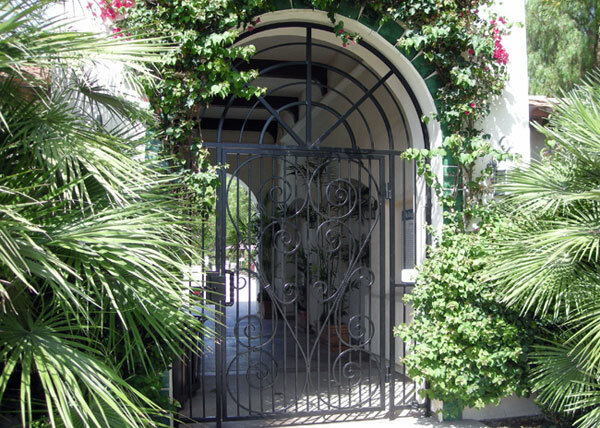 We used ½" solid steel bars to create the decorative design, giving our client a mediterranean style gate to secure the front courtyard of their home. 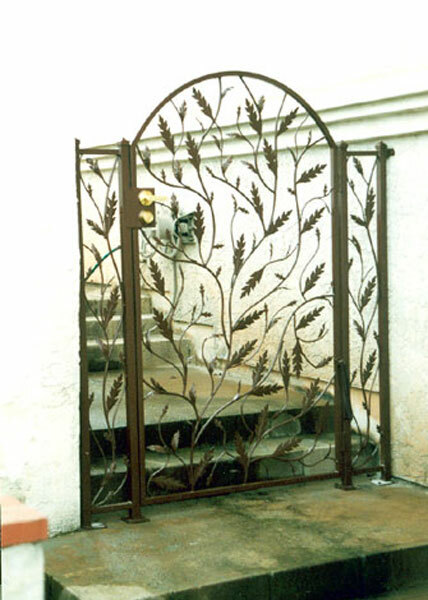 We custom built the gate based on our client’s design. G48 We built and installed this decorative gate for the outdoor dining area of a popular restaurant in San Diego, CA. 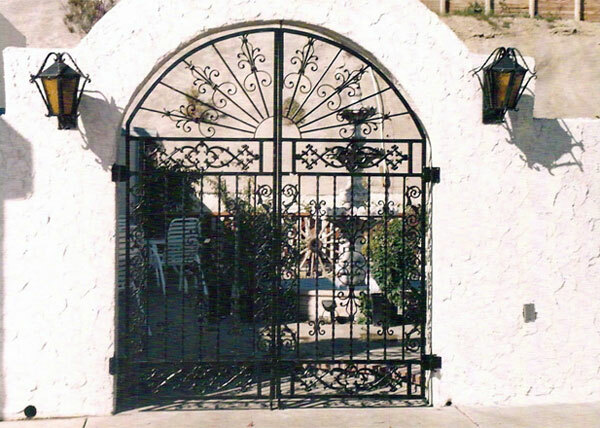 The steel gate was built with casting designs set within a 1" steel tube frame and attached to ½" pickets to create a beautiful Spanish style gate with a black powder coat finish. 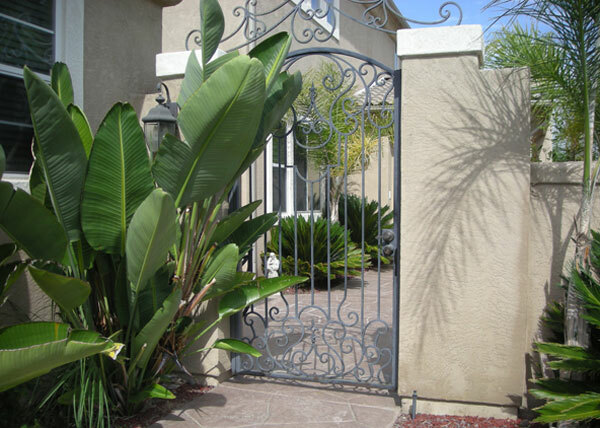 G49 Using cast "bird of paradise" ornate designs, this residential gate was built and installed in Point Loma, CA by B.A. Ramirez & Sons. The design was completed with decorative knuckles and spears on the lower part of the gate. 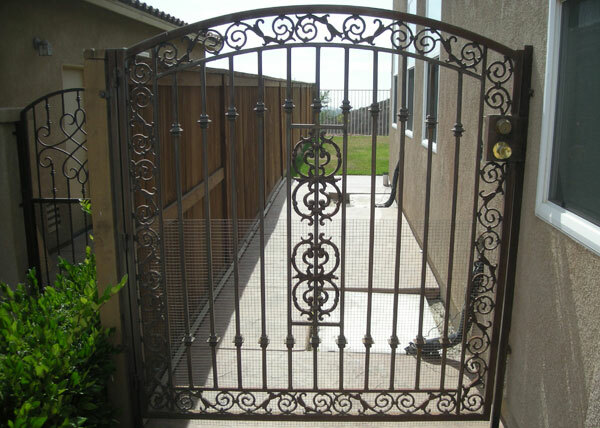 G50 We installed this custom made residential steel entry gate in Chula Vista, CA. The arched French style gate was built to fit the existing archway of this home. Doggie pickets on the lower part of the gate keep the owner’s small dog inside. 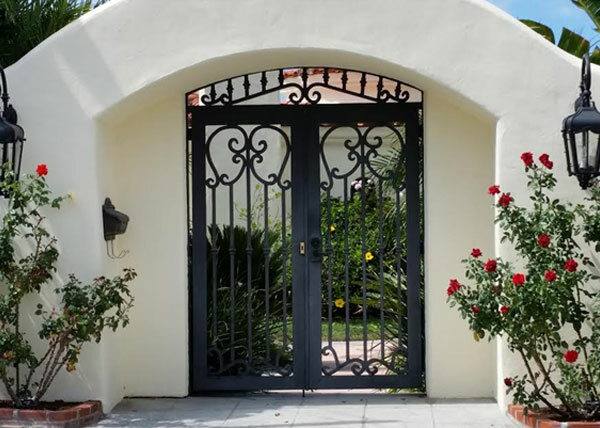 G53 We built and installed this Spanish style gate for a Carlsbad home using a steel tube frame and decorative castings at the top and bottom. The gate also features steel tube pickets with decorative knuckles. 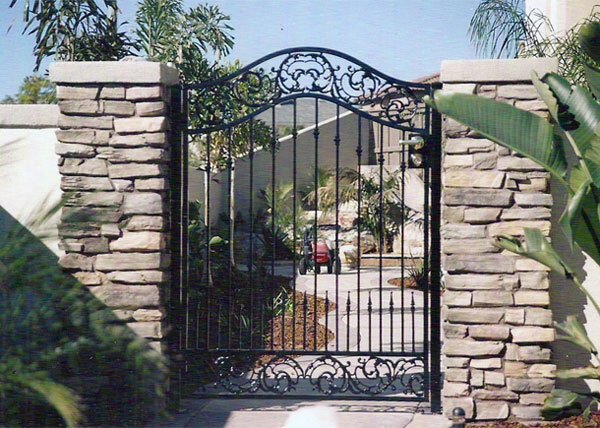 G54 This residential ornate gate was installed in La Mesa CA. It has a 1" steel tube frame, ½" pickets and ornate designs formed and made using ½" flat bar. 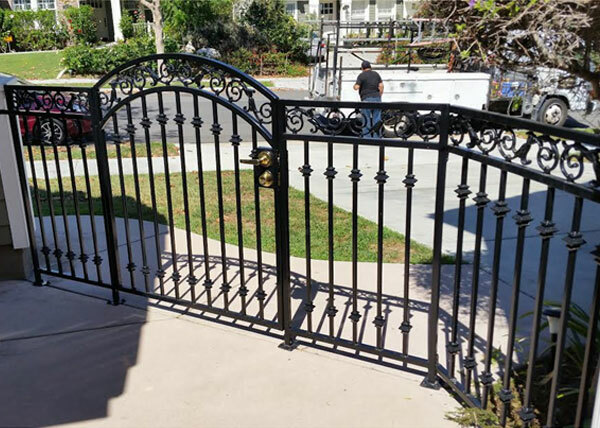 G55 This highly decorative Italian style residential gate was installed in La Jolla, CA. Materials used 1-½" steel tube frames with decorative "S" scroll castings throughout. It guards the entrance to our clients home. 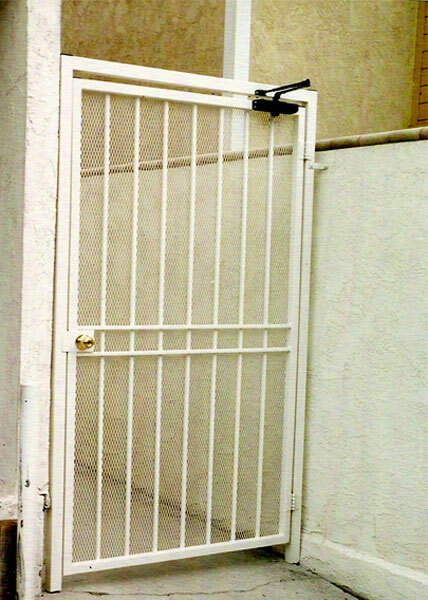 G56 This security entry gate is designed for rental property security. The expanded metal backing keeps unwanted hands from reaching through the gate to unlock it. A postal "key keeper" box is located next to the lock to allow posgtal access. G57 ½" x 1" solid steel for the arch/frame and ½" steel tube for the vertical pickets which also have knuckle designs. The vine look is done by forming and bending ½" round solid steel and attaching pressed steel leaves. The lower kickplate has decorative caps attached. G58 Materials used: 1" steel tube frame with ½" steel tube pickets with two knuckles on each picket. Ornate castings are placed along the upper and lower frame. The perforated metal screen allows for privacy to the inner courtyard. G59 At the front entrance to a apartment building in Pacific Beach, this gate can be open ed by the telephone entry you can see on the wall to the right of the gate. The locked and secured gate can be opened by pressing a keypad with a code for access. 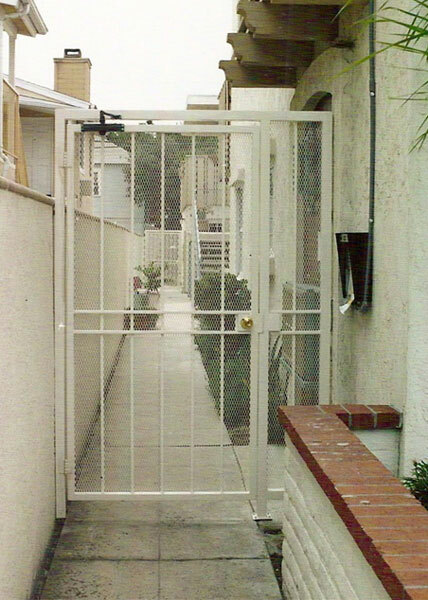 G60 This commercial security gate located in Pacific Beach CA protects the alley access to apartment building. 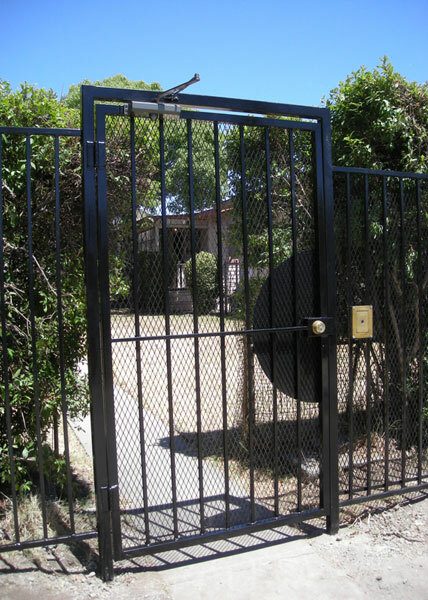 The overhead hydraulic closer closes the gate quietly and the expanded metal backing connected to the 1.5" steel tube frame combine for a high security gate. 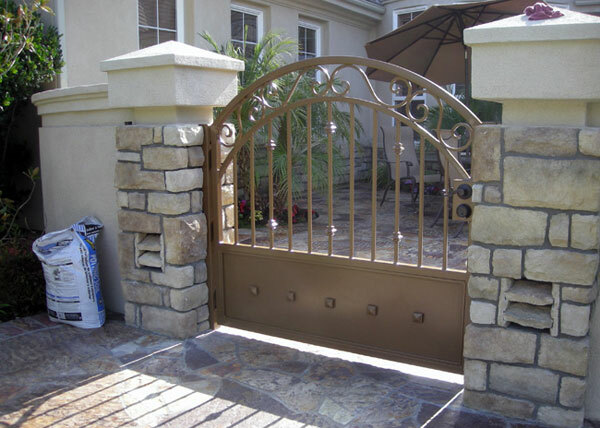 G61 This arched Mediterranean style gate was installed in the La Mesa area. Using 1" steel tube frame with ½" steel tube pickets. The ring designs below the upper horizontal and "bird of paradise" castings above the lower horizontal we created a simple design entry gate. 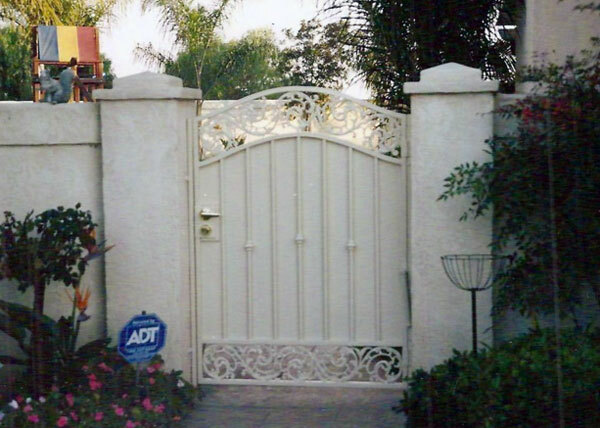 G62 This beautiful floral residential entry gate was installed in Encinitas, CA. 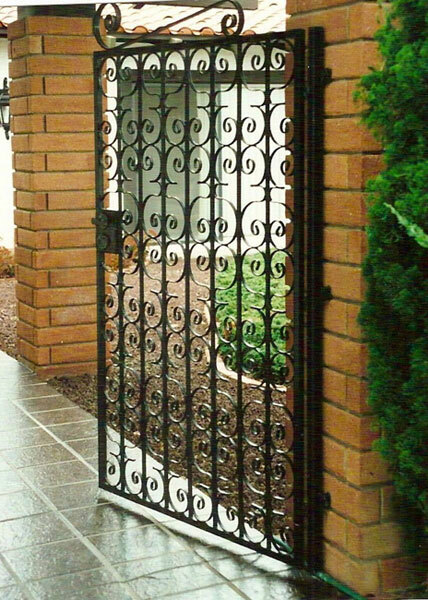 This gate is at the front entry of a home. With no straight bars, the bent round material gives a "vine look. The materials used are 1" steel tube frame with ½" round material for the vines. Leaves are pressed steel that is stamped to give a detailed look. 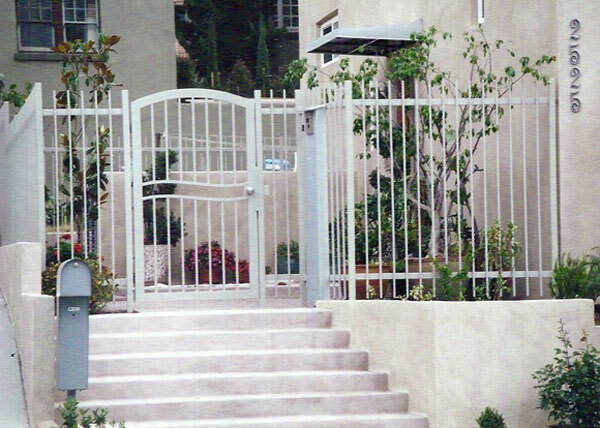 G63 This commercial access gate was built for a property in Del Mar. 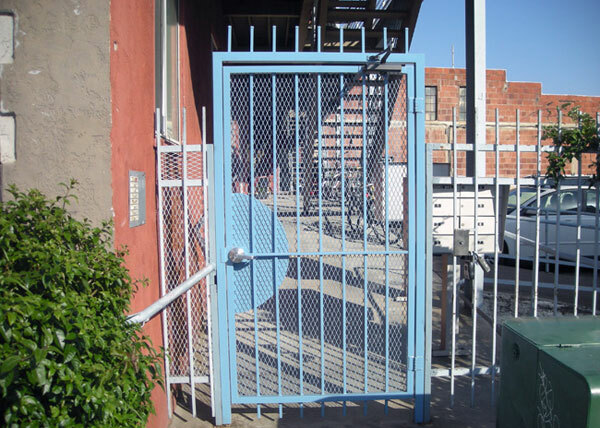 The design allows for visibility through the gate but secured with the expanded metal backing which prevents reaching through to open the gate. A sheet metal protective area prevents tampering with the lock. The lock is a high quality KABA E-Plex 2000 system. Access is granted with then a four digit code. A overhead hydraulic closer gently closes the gate. 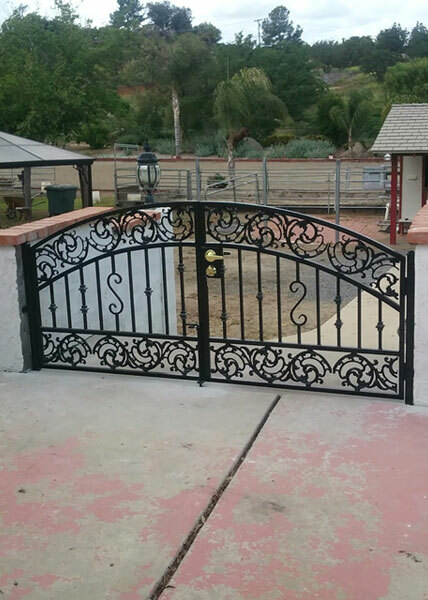 The gate is coated with zinc primer and a black powder coat finish. 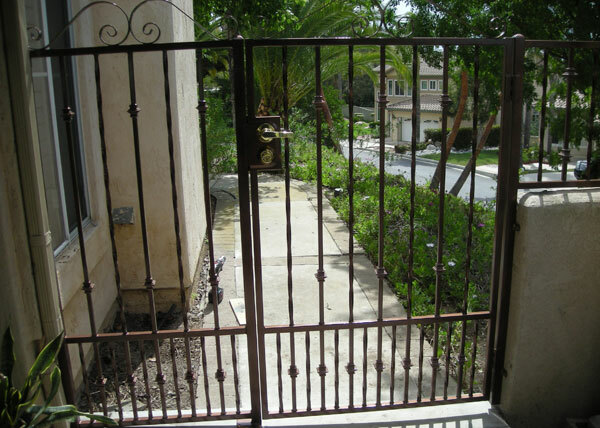 G65 We installed this residential gate in Rancho Santa Fe, CA. 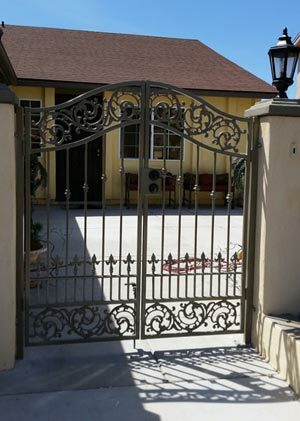 The custom arched gate features decorative grape leaf castings and a row of "doggie" pickets above the lower casting to keep our client's dog in. This sturdy entry gate is made with a 1" steel tube frame and ½" steel tube pickets, and was finished with a coat of zinc primer and black powder coat paint finish. G66 B.A. 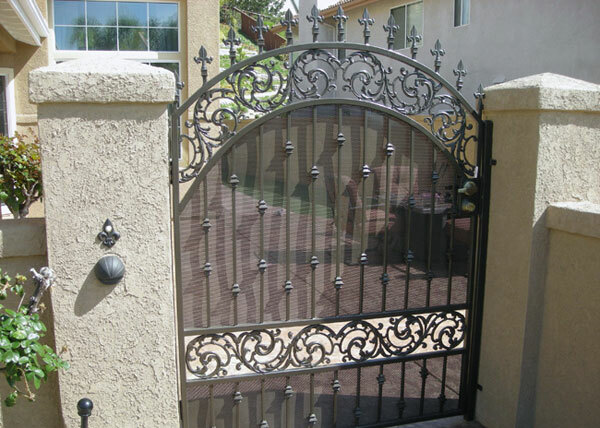 Ramirez & Sons installed this residential front gate enclosure in San Diego, CA. 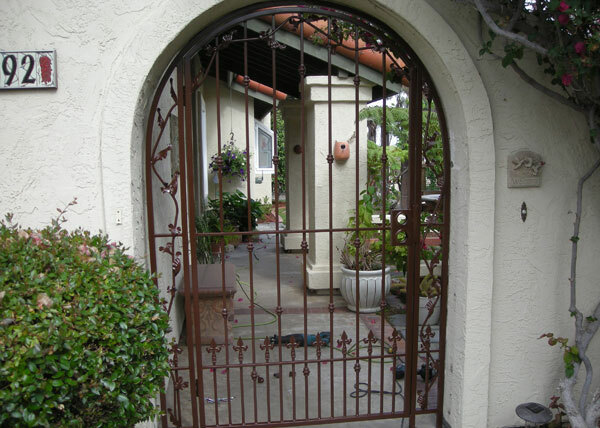 The steel gate is built using a 1" steel tube frame and ½" steel pickets with knuckle designs and a decorative casting. It features a deadbolt lock and non-locking passage handle making it both decorative and secure. 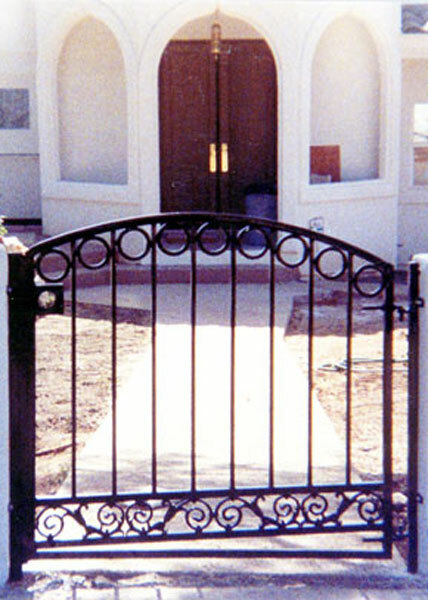 G67 We built this ornamental steel entry gate for a San Diego home. It is made with a 1" steel tube frame and has cast aluminum designs welded in place. After fabrication the gate was powder coat paint finished and installed by our installation team. 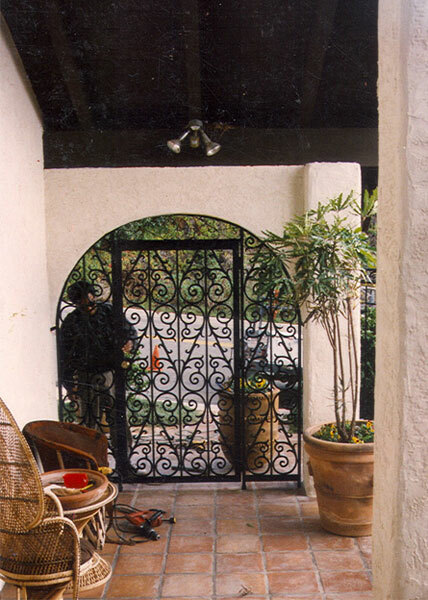 G68 We built and installed this arched decorative steel gate for a home in La Jolla, CA. The frame and designs were made with 1" steel tubes. We used a bending machine to create clean and consistent bends throughout the design. 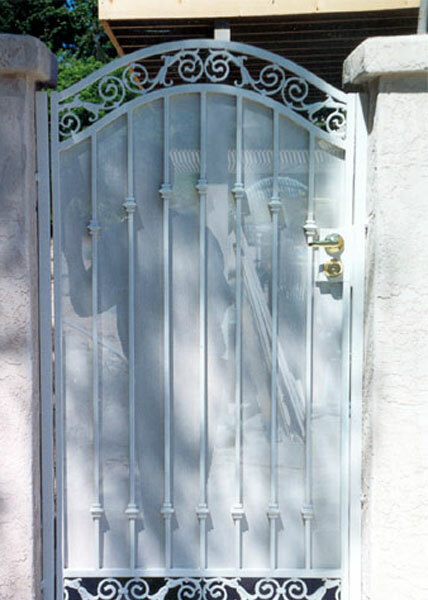 After fabrication, the gate was galvanized and finished with a white powder coat. 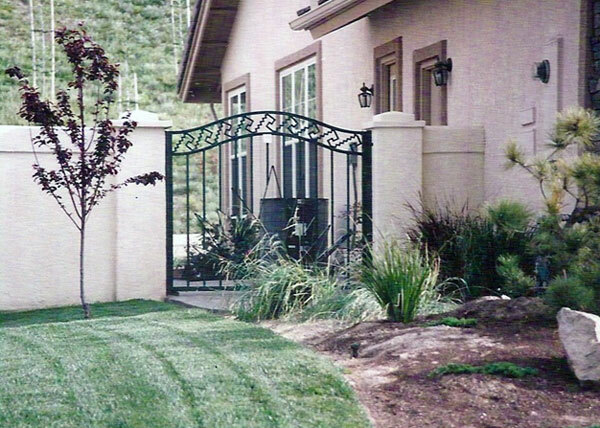 G69 This ornamental pedestrian gate was installed in Alpine, California. The decorative cast scrollwork accent pieces were made in a foundry, then inserted into the client's custom-designed framework at our Chula Vista shop. Its 1" steel tube frame and ½" steel tube pickets provide strength and security, while the black powder coat paint finish resists weathering. G70 We built and installed this custom backyard garden gate for an Alpine residence, in order to safely enclose their outdoor patio. The decorative picket design includes ornate knuckle accents, a 1" steel tube frame, and aluminum castings inserted into the framework. 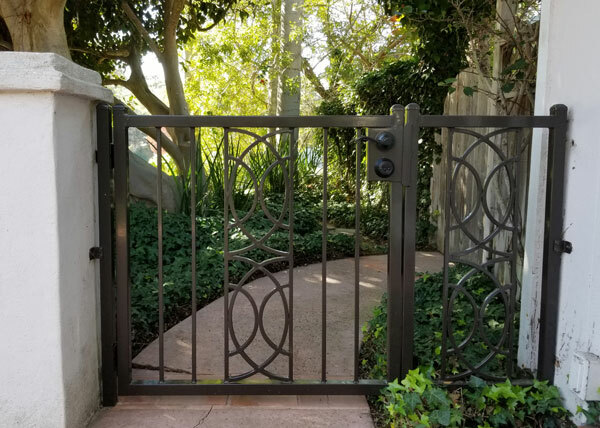 G71 We installed this residential, side yard gate for a La Jolla home. It was constructed using 1.5" square tube framing and ½" solid steel for the designs, which were hand forged in our Chula Vista shop. 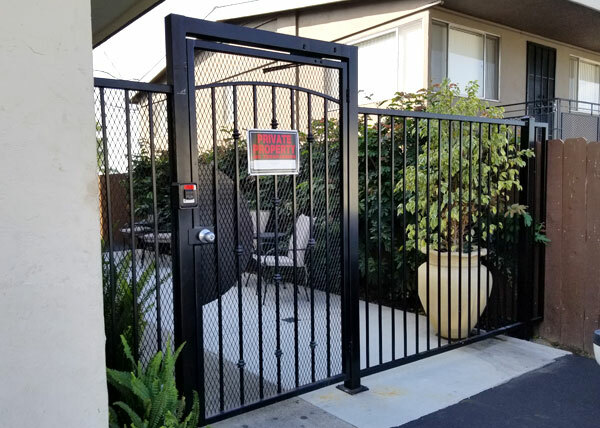 G72 This high security pedestrian access gate in Encinitas was built and installed for a small condo project. Crafted with an attractive knuckle design, it features a 2" x 4" steel tube jamb and 1.5" x 1.5" steel tube gate frame for extra strength and security. It also includes expanded metal backing and a solid sheet metal guard that prevents anyone from attempting to tamper with the lock.